busymommylist: Frenemy Jane Review And Giveaway!! We have a couple issues here at our house, at our school and we have had our share of bullies, all different types of bullies. It hurts a lot to have to send my oldest son to school sometimes and I sometimes wonder if some of his stomach pain isn't caused by stress from a couple kids in his school. He was diagnosed with a few disorders, like, celiac, gastroperisis, GERD, acid reflux and the latest, possible gall bladder disease. At the beginning of his school career, everything was fine, he had lots of friends and loved school and did exceptionally well with his grades. After a couple of years, as they grew up a little bit, my son started having bad stomach pains and was often sick, especially at night and in the morning. He always loved school, so, I didn't think there was anything wrong at school, so, we started taking him to our doctor and from there, GI specialists. Since he was diagnosed after several tests, I didn't think much about the fact that there could still be a problem with anybody at school. One day, I asked about one of his friends and he didn't really seem as happy as he usually was when talking about this specific friend. I figured right away, something was wrong and we ended up having a nice long chat about his "frenemy". He has a few very close friends, which is nice. I don't know why he decided to stay friends with this other boy at school, who started being mean, calling names, spreading rumors and just randomly making fun whenever he saw my son on the bus or at school. As they got older, (they are both in 5th grade now. ), his "frenemy" has acquired a few friends, including one of my son's friends, which really hurt him pretty bad. He still has his few close friends and we try to have them over as often as we can and we are dealing with his stomach concerns as best we can. Stephanie Sorkin has written some of our most favorite books! This book, Frenemy Jane, is no exception! Now, my oldest son may think or act that he is to "big" for this book, BUT, he has heard his little sister read it and even made the remark that, "OMG! That is exactly how it started with ..."
The illustrations are adorable and one of the best parts of this book, is the classroom discussion questions. This is a very important topic and sometimes I don't think that just having a "Bully Week" is enough. I wish, Frenemy Jane was in every classroom in every elementary school. The discussion questions in the back of this book, could be a whole lesson in class that I'm sure any teacher can fit in to their busy schedules! There is even a gluten free recipe in the back, which would make a wonderful ending to one of the most helpful books and discussions in class. 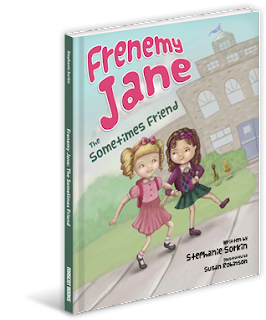 Frenemy Jane follows a little girl named, Maddie, who has a "friend" named, Jane. They knew each other since preschool and have been friends for a while. However, as they get a little bigger, Jane starts to do mean things to Maddie and Maddie starts to question their friendship. Luckily, Maddie's mom started to notice something wasn't right, so, Maddie told her mom about her "friend" Jane and they and a nice long talk about their friendship. Maddie went to school the following Monday, with confidence and knew just what she had to do. Sorry I missed your giveaway. This book sounds fantastic. I'm definitely going to watch for it.